Another OPR hike: Too soon? A number of risks emerged in the first half of 2014, sending jitters across financial markets. In some developed nations, the negative sentiments of geopolitical affairs and economic uncertainties fuelled concerns of economic slowdown. Notwithstanding the uncertainties in the advanced economies, Malaysia’s gross domestic product (GDP) growth accelerated to 6.4% in the second quarter of the year, up from 6.2% in the first quarter. While it is an indication of our economic strength stemming from well-thought-out policies by the Government and Bank Negara, the robust economic performance has fuelled speculation of another hike in overnight policy rates (OPR) come September. This follows the earlier hike of 25 basis points in July that brought the OPR to 3.25%, which is still deemed as a “normalising” level to the economy at large. However, given the current economic challenges and a closer look at on-ground sentiments following recent inflationary pressures, such a hawkish expectation on further OPR hike should warrant some reconsideration. In the last OPR hike, it is clear the central bank is concerned about addressing financial imbalances. Nonetheless, the development of demand-pull inflationary pressure should also be closely monitored when considering the next course of monetary policy action. It should be noted that the average inflation rate of 3.4% in the first half of the year, which was above the long-run average of about 2.5%, was largely cost-push. The rising global petroleum product prices and in particular, the subsidy cut adjustment to the local pump prices last September contributed to the elevated prices. As stated in the July Monetary Policy Committee (MPC) meeting, Bank Negara’s main focus right now is to address the financial imbalances within our economy. Essentially, the high household-to-GDP debt ratio, which stood at 86.8% at end-2013, is uncomfortably close towards 90%. 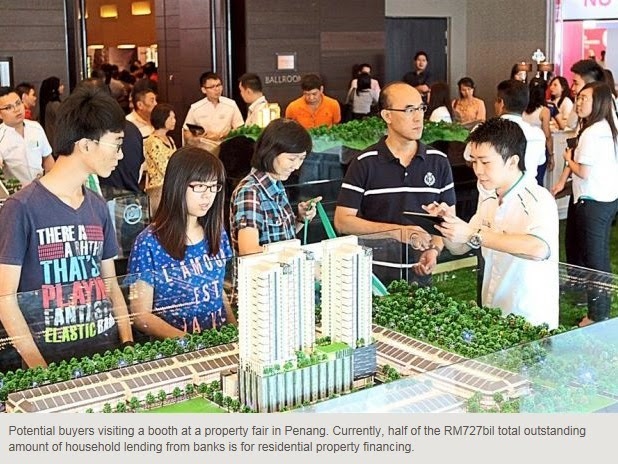 Currently, half of the RM727bil total outstanding amount of household lending from banks is for residential property financing. In this context, addressing financial imbalances is also to tackle the larger issue of real estate valuation. If left unattended, the house price escalation at a peak of 12.2% house price index growth in the last quarter of 2012 may be a property asset bubble in the making. The consequences of a financial bubble burst are serious – the United States and the United Kingdom are still grappling with the aftermath of such an event since 2007. Lest we forget, the Government has put in place various macro-prudential policies to curb speculative activities in the property market, unduly-high house prices and the escalation in household indebtedness. The notable policies include limiting the maximum tenure for property financing to 35 years, the removal of the Developer Interest Bearing Scheme and the hike in real property gains tax. Although the actual impact of macro-prudential policies is more difficult to gauge than a blunt OPR hike, there was a notable slowdown in the housing price index in 2013. The latest housing price index growth has eased to 8% in the first quarter of the year, down from the average growth of 11% in 2013. However, in terms of bank loans for financing of residential properties, the growth rate has hovered at around 13% since 2011 – conspicuously unaffected by the macro-prudential tightening. An insight from the International Monetary Fund research paper published in April 2014 on the Malaysian housing market suggested that there is no underlying evidence of a direct correlation between the rise in house prices and the residential loans growth. This should not come as a surprise, given that progressive macro-prudential measures are not meant to choke the market off responsible homebuyers. Essentially, these macro-prudential policies are meant to strike a balance between curbing speculative profiteering of property assets and encouraging responsible household loan taking. Other policy options at hand for the central bank to tighten irresponsible lending activities include adjustments to the statutory reserve requirement (SRR). SRR is the legal requirement of money balances that banking institutions have to comply with. An increase in the SRR ratio will effectively absorb liquidity within the banking system, thereby containing loans growth. The last SRR revision was in July 2011, when Bank Negara raised it to 4% from 3%. In this regard, if Bank Negara feels that the OPR adjustment will not be adequate to deter speculative buyers, they could still raise SRR by 1 to 2 percentage point come September or November. More importantly, the authorities will likely gauge the effectiveness of earlier policies and will not rush into another OPR hike. Meanwhile, the Government also has the flexibility to design policies to meet the objectives of pre-empting potential dangers from an asset price bubble. The annual Budget come this October will be an avenue to introduce such policies. At this juncture, there is still ample room to manoeuvre without involving the OPR. If the remarkable 6.4% second quarter GDP growth is any solid assurance of a stronger economy moving forward, look again. During the quarter, the export sector was the key driver of the GDP performance (8.8% growth versus first quarter 7.9%). In the meantime, private domestic consumption growth moderated for the fifth consecutive quarter at 6.5%, down from the last peak of 8% in the third quarter of 2013. This onset of the moderation coincided with rising inflation on the back of the fuel subsidy rationalisation. This downward trend will only likely persist in the coming quarters, given the anticipation of a new fuel subsidy rationalisation mechanism and the implementation of the goods and services tax (GST). As private domestic consumption makes up half of Malaysia’s GDP, it will be a challenging time for consumers to brace for domestic headwinds. In light of the softening domestic consumption and geopolitical uncertainties that would affect the global economic outlook, the second half of 2014 will be expected to fall short of the first half performance. Although Bank Negara and consensus have raised the full-year GDP target upwards, it is nevertheless below the first half growth. An OPR hike now will only further weigh down domestic spending. To complicate matters more, the impending GST next April will likely distort the macroeconomic trends as consumers bring forward consumption prior to implementation, as seen in recent Japan’s sales tax hike early this year. The short-term economic data that we will be facing will be accompanied with noises. This will only add to the challenges for Bank Negara to disentangle the signals from the ground and evaluate the effectiveness of its monetary policy stance. Rightly so, Bank Negara has to consider its next move carefully.